Indigenous media is a phenomenon that is the active, self-representation of indigenous people via visual forms. It is also seen as a new step, by Anthropologists, in allowing those people we study and have studied to have their own voice. To speak for themselves. Linda Tuhiwai Smith attacks western research and proposes Decolonizing Methodologies in research of indigenous people. She names ‘Healing’, ‘Mobilisation’, as well as ‘Transformation’ and ‘Decolonization’ as general methodologies; all of these culminating in Self-Determination (Smith, 1999). In my opinion these aspects are not tied by linear sense but are on-going feedback processes that add to one another in a constant dynamic relationship, for instance Self-determination can feed back into ‘mobilisation’ and ‘healing’ which in turn increases the degree of autonomy of indigenous people as they seek to regain what has been stolen and lost. To begin with it must be expressed, in the spirit of self-determination, that ultimately it is not important if we see indigenous video as a decolonizing methodology, but whether the indigenous people themselves see it as being useful is. This also raises the question of whether decolonization is desired or not? It is safe to say that decolonization as a general ideal is desired, evident in Smith’s book ‘Decolonizing Methodologies’. Smith calls upon a protection and restoration of traditions, a ‘healing’ process. This is captured well in “screen memories” which show that tensions between the past erasure and the current visibility of indigenous participation in film and video are central” (Ginsburg, 2002: 40) in moving forward with the ‘healing’. In this way the task of regaining cultural and intellectual property of indigenous people that has been appropriated by the West and the domineering structures imposed on those left behind, is dependent on how locally made video can express a claim to traditions that have been stolen. Indigenous opinion is in agreement; for example “Nunavut” an indigenous film depicting traditional life of Inuit people before local and global interference via governance, altered that way of life, is much loved by those people. They believe it will help portray their traditions to their descendants who maybe can have knowledge of their roots, and thus regain their collective stories and histories (Ginsburg, 2002). Further evidence for the desire of indigenous people in utilising film can be seen in the cases of the Kayapo people and also with the Yanomamo who took up the camera with fervour and aptitude (Asch et al. 1991) to attempt to both protect and regain cultural artefacts and educate, not just themselves but, as will be touched upon, the outsider as well. Visual projects by Indigenous people often show an active ‘Mobilisation’ that feeds on the hurt caused by (Neo-)Imperialist actions. “We were stripped of our land…And after all the plunder, now they want to appropriate our images” (Salazar & Cordova, 2008:39) Salazar describes the activist movement in its defence against Western mass media’s theft of images, as part of a wider social movement amongst Latin /American filmmakers. Indigenous people are aware of the importance of ‘mobilising’ themselves and their ideas to facilitate decolonization. “The old colonial adage that knowledge is power is taken seriously in indigenous communities and many processes have been discussed and enacted in order to facilitate effective ways of sharing knowledge” (Smith 1999: 16). This control of knowledge coupled with visual texts on which to portray it can be highly potent in mustering support and coordination. Front cover of “Kangura” magazine, the caption next to the machete reads “Which weapons are we going to use to beat the cockroaches for good?”. Various forms of media and images have often been tools for the arbitration of history (Smith, 1999), from photographs to film to radio; they have added power to the colonizers against the colonized in the battle of contested histories; so we should recognise the power of media in normalizing ideas and emotions, and of mobilizing action. This is evident in a different context; that of the Rwandan genocide when state media provided a platform for the ethno-political rhetoric by ‘Hutu Power’ leaders. (Mamdani, 2002) The encitement of hatred was conjured up by the use of their favoured ethno-historical accounts of the, often fraught, relationship between Tutsis and Hutus, this coupled with an environment of normalised violence stretching back to German colonial rule (Mamdani, 2002). The images in Fig.2 encapsulate this with the depiction of a machete next to the dehumanised call for genocide. Therefore the power of media is huge, often terrifyingly so as with Rwanda, so if this can be harnessed for good via Indigenous video and TV in decolonizing attempts it may have a huge impact in mobilising people and efforts. However it must be elucidated that the Rwandan people were not given the ‘conceptual tools’, as prescribed by Smith (1999), to critically assess their own shared histories and thus, as ‘victims’ (Mamdani, 2002) were unable to escape the structures of normalised violence they existed in. To move away from an account of the lowest nadir of human action, I actually would like to turn this around and focus on how the agency of human people can show humanity in a better light. This ‘good’ route has been attempted by indigenous film makers, armed with the conceptual tools; evident in Latin America where they have recognised the structures and networks of their filmmaking; and they spread their visual media via these networks. This can be seen in screen memories where they attempt to portray their story to the outside world, but in a way that transcends the constraining structures, like state controlled media, or global mass media (Salazar & Cordova 2008)). This has shown how indigenous people have combined transnational networks and local mobilisation to challenge “indigenist” thinking, and thus showed a high degree of agency in mobilising in attempts at decolonizing themselves. Linda Tuhiwai Smith names another methodology as that of ‘transformation’. One aspect that relates to networking in indigenous filmmaking is the transformation and existence of indigenous people gathering under the same identity… that of being ‘Indigenous’. In the film Nunavet the subject people did not originally see themselves as Inuit. They had identified with smaller tribal units who ended up identifying collectively with the term Inuit, in order to rescue their separate traditions (Ginsburg, 2002). This shows a conscious attempt by indigenous people to spread their stories via film, and regain control of their traditions. The term ‘indigenous’ internationalizes the experiences, issues and struggles of colonized peoples (Smith, 1999) and screen memories represents this in the visual sense (Ginsburg, 2002). It might appear that an overarching identity will cover up people’s traditional identity, but it actually illuminates it; for example the Kayapo who over emphasised traditional dress for visual activism (Turner, 1992)(also see Fig.3) Furthermore these people share identity of ‘having been colonized’ in a truly globalised world where identities transcend spatial limits; these people are attempting to regain autonomy via “collective voice” enabled by creation and efficacy of a new identity. Indigenous films incorporate ‘poiesis ’ in their portrayal; a process of ‘active making’ (Salazar & Cordova, 2008), a dynamic process of transformation which film is a vehicle for. In fact the idea of autopoiesis is highly applicable in that meaning is never fixed it must change for the effectiveness of the person and their shared identity as an indigenous person. This effective and active person looks to alter existing “embedded aesthetics”, or the social embeddedness of textual practices (Ginsburg, 2002), and replace them with new visual texts which deny the oppressive structures that have remained since colonial times. The popular discourse on decolonization is often seen from a political and economic position, but this view misses things; “Decolonization once viewed as the formal process of handing over the instruments of government, is now recognized as a long term process involving bureaucratic, cultural, linguistic and psychological divesting of colonial power.”(Smith, 1999: 98). Focus should be put on returning control of representation concerning cultural, linguistic and psychological elements to indigenous people. Many who hold this view agree that representation should sit firmly in the palm of the indigenous person. Smith says that “The challenge is always to demystify, to decolonize” (1999: 16) This informs people how knowledge has been constructed and represented, not just handing them a surface information but also questioning authenticity of existing discourse created as a result of colonialism and only then can a new ‘indigenous’ discourse be created, reclaiming old collective histories for themselves. Furthermore in the West we accord a lot of significance to the visual, and often think that it will help represent the indigenous story. However this does not make the indigenous world “available for photographic capture or ethnographic predation, however compassionate the Westerner” (Faris, 2002:87); Indigenous people should choose if and how they use visual technologies to tell their story, because as Asch says “The story we now want to hear is not ours to tell” (Asch, 1991: 102). Instead we must act as facilitator in helping the Indigenous filmmaker portray their story, but without conditions. The aspiration of self-reliance of the indigenous filmmaker (Salazar & Cordova, 2008) is a paradox of his situation in that they are fighting against visual imperialism only to find themselves constricted by the external hand that feeds their expenditure. Many of us in western academia are now sensitive to the possibility of perpetuating a neo-imperialistic environment and wish to avoid this, yet we still yearn to help. Mass media has been seen to appropriate images of indigenous people and has thus come under attack by indigenous researchers like Smith. However perhaps the often global phenomena of cinema can help with the decolonization of local cultural portrayal. Feature films can be seen as cultural documents, projecting structured images of human behaviour, social interactions and world views (Weakland, 1975). Furthermore cinema often provides us with the some of the most significant and engaging narratives on cultures (Asch, 1991). Thus even fictional work expresses cultural identity of those who produce it, even if it isn’t as self-conscious as ethnographic and indigenous media. If cinema is created by a formally colonized people then does is fall into the indigenous category? If so then the growth of Bollywood could be considered indigenous media par-excellence in that it is now challenging Hollywood both economically and autonomously portraying Indian heritage. Linda Tuhiwai Smith ends a chapter in her book with “The book is written primarily to help ourselves”(1999: 17). This shows the importance of self-determination throughout decolonization methodologies, including that of video. Healing can be enacted by a self-made film loved as a representation of lost traditions and mobilisation in spreading ideas visually and mustering support. The dynamic relationship of the methodologies, with the help of video, is present; transformation into one people under the ‘indigenous’ banner, meant greater power at mobilising activism. This was especially the case in Latin America where films and their networks facilitated change. The western Anthropologist, under intense criticism, finds himself in a liminal state. Smith banishes them from research of indigenous people including in video form, and they are not welcome in the mission of decolonization. Yet they strive to help and this drive of modern anthropologists to reverse the dynamic structures in place that they helped to create during colonialism should be harnessed by the indigenous person. We talk of self-determination; well then hire the anthropologist but as with any opinion, image, text; assess it critically and do not take certain histories and knowledge for granted. Indigenous media provides the means of decolonizing people, with these people knowing what they need and want, especially as they can portray what has been stolen. Figure 2 Unknown. (1993). Primary Sources From the Rwandan Genocide.Available: http://rwandafile.com/Kangura/kanguralist.html. Last accessed 4th Dec 2012. Figure 3 Unknown. (2004-2011). Kayapo, Brazil. Available: http://www.rainforestfoundationuk.org/All_Photos?offset=1&photo=1781&index=8. Last accessed 10th Dec 2012. Figure 1 Unknown. (2012). Indigenous Filmmakers. Available: http://www.nativenewsnetwork.com/indigenous-filmmakers-you-could-win-a-trip-to-new-orleans.html. Last accessed 4th Dec 2012. Asch, T., J. I.Cardozo, H. Caballero & J. Bortoli. (1991). The Story We Now Want To Hear Is Not Ours To Tell: Relinquishing Control Over Representation: Toward Sharing Visual Communication Skills with The Yanomami. Visual Anthropology Review. 7, pp. 102-106. Faris, J. (2002). The Gaze of Western Humanism . In: Askew, K & R. Wilk The Anthropology of Media. Unknown: Blackwell. pp. 77-90. Ginsburg, F (2002). Screen memories: resignifying the traditional in Indigenous Media. Berkeley: California University Press. pp.39-57. Mamdani, M (2002). When Victims Become Killers: Colonialism, Nativism, and the Genocide in Rwanda. New Jersey: Princeton University Press. Salazar, J.F. & A. Cordova. (2008). Imperfect Media and the Poetics of Indigenous Video in Latin America. In: P. Wilson & M. Stewart Global indigenous media: cultures, poetics, and politics. Durham: Duke University Press. Smith, L.T. (1999). Decolonizing Methodologies: Research and Indigenous Peoples. London: Zed. Spitulnik, D. (1993). Anthropology and Mass Media. Annual Review of Anthropology. 22, pp. 303-306. Turner, T. (1992). 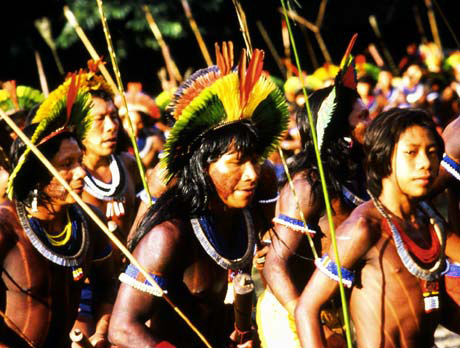 Defiant images: the Kayapo appropriation of video.Anthropology Today. 8, pp. 5-16. Weakland, J. (1975). Feature films as cultural documents. In: Hockings, P, Principles of Visual Anthropology . Unknown: Mouton. pp. 231-51.